While the Mayans were incorrect with their 2012 prediction, there may come a day where modern civilization crumbles and gives way to an every-man-for-himself ordeal. 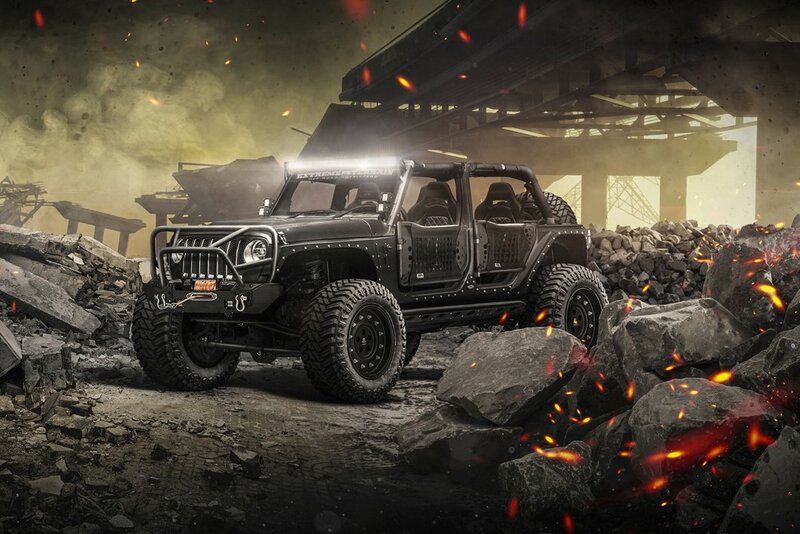 Intended to look daunting and mean, the Doomsday Apocalypse Jeep is modeled for such a catastrophic event, using a variety of rugged armor and off-road components to facilitate passing over treacherous terrain and safeguard the occupants in the process. 50 Cal Ammo Can: A durable and water tight 50 Caliber Ammo Can provides a safe and secure storage container for tools and recovery gear whilst maintaining the rugged look of Apocalypse Jeep. Stubby front bumper: A large forward protruding grille guard makes this heavy-duty bumper ideal for pushing through a horde of zombies. The stubby nature of it also maximizes articulation of the front wheels so they won’t get hung up on obstacles as you head for the hills. Steel Body Armor Cladding: 3 mm thick steel plates attached to the lower sides further propagate the foreboding look of this Doomsday Jeep, in addition to providing outstanding armor to combat rocks and other minor obstacles. Corner guards: Continuing the armored motif, black diamond-plate corner guards beef up the sheet metal located around each rear tail light and add a menacing look to boot. Suspension Lift: In the face of danger, there is no time to worry about ground clearance. A complete longarm 6” suspension lift kit means Doomsday Apocalypse Jeep can tackle any off-road sortie by stuffing up to a 38” tire into the fender well. Shorter zombies may not be able to reach the door handle, too. Light Bar: There is no telling when you might have to hop into the Jeep and hightail it out of there. Thus, a massive 50” dual-row LED light bar sitting atop the windshield or roof will be a godsend should the unthinkable occur at night. Tires: Chunky all-terrain tires bring together the dominating look of the Doomsday Apocalypse Jeep. Rated for mud and snow, the special chip and cut resistant compound means these country tires are ready to roll out of trouble – be it a swarm of walking dead or a platoon of invading extraterrestrials. The 2018 Wrangler may be the most capable Wrangler to date, and Overland Jeep is designed to take advantage of this. Outfitted to run deep into nature, Overland Jeep provides a stable and versatile off-road platform, one that can tackle and live on tough trails for days at a time. Load a few friends, some food and clothes and let Overland Jeep take you beyond the asphalt. Trail Force HD Bumper: The stubby design allows for maximum articulation of the front suspension and is manufactured with a plethora of trail-ready features, such as an integrated winch mount and heavy-duty D-rings. Built for off-road adventure, this all metal bumper with grille guard isn't afraid of the trail. 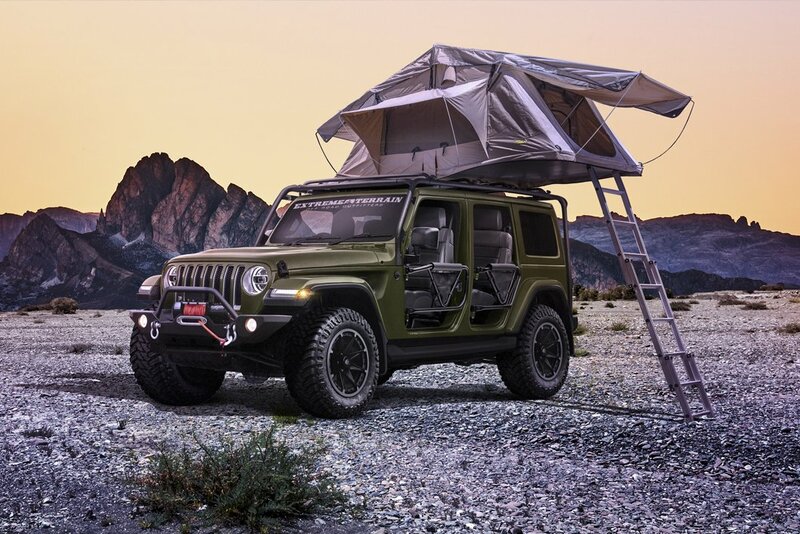 Full Roof Rack: Overland Jeep is meant to dwell in the woods for days at a time, and a full-length roof rack system ensures there is plenty of cargo capacity to tote along all the necessary gear for your off-road endeavors. Roof Tent: Making use of Overland Jeep's roof rack, a folding roof tent turns Overland Jeep into a comfortable mobile campground. Sitting safely off the ground, a roof tent can fit 2-3 people and is water and bug proof. Trail Lighting: Low profile 3" LED lights sit cleanly atop the grille hoop and at the base of the windshield. Great to illuminate the path ahead, cube LED lights can also be easily rotated to help light up your campsite. Safari Doors: V-Shaped safari doors open up Overland Jeep and provide unencumbered visibility when it comes to navigating around or over a tricky trail obstacle. Husky Mud Guards: Specifically molded for Wranglers, front mud guards will help keep the sides of Overland Jeep free from mud, water and dust - a welcome feature when wheeling through the woods with a safari door. Aggressive Wheels: Helping to promote the off-road look, Overland Jeep rocks a 17" 8-spoke wheel finished in matte black with an aluminum lip. To further stand out from the crowd, these aluminum wheels also feature a removable gun metal trim that is inserted between the spokes. Beach Jeep is intended to provide all the utility needed for a day at the beach. Whether you are after a relaxing day in the sun, or a more intense, adrenaline-filled wave surfing adventure, Beach Jeep is capable of trekking to an unchartered shoreline, while maintaining all the necessary open-air comfort and commodity to keep the day fun and free. Roof Rack: With space to fit possibly up to three surf boards, a roof rack system is the ideal place to safely and securely transport all the necessary beach day gear for you and a few friends. 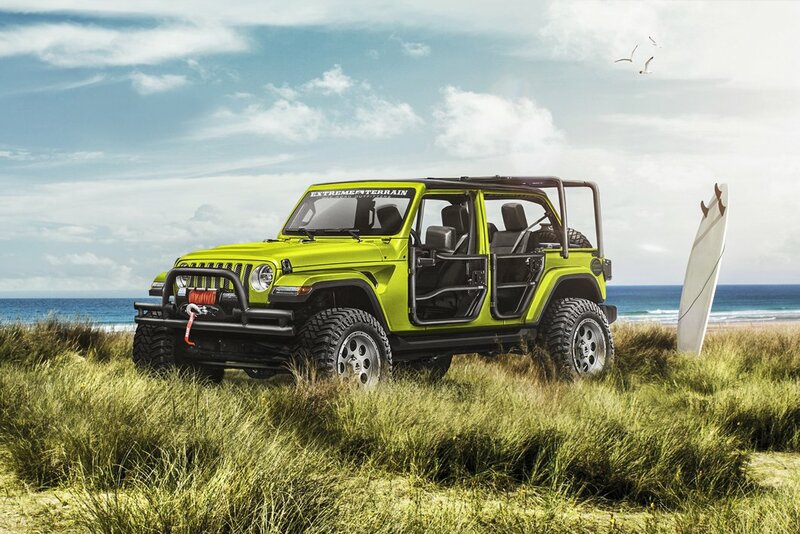 Tubular Doors: Tubular style doors embrace the free spirit nature of Beach Jeep by providing an open, breezy atmosphere. Quick to hop in and out of, the doors maintain structural integrity thanks to their large diameter steel construction. Safari Top: Drop the top, pick up some rays and let the sun blow through your hair! A Safari style mesh top easily folds back to expose the entire cabin to the ocean air. If things are getting too hot on the beach and you need to throw some shade, flip the top back up and let the sea breeze cool you off while the special mesh material blocks harmful ultraviolet rays. Ballistic Pro Seat Cover: A quality set of ballistic nylon seat covers keeps the factory upholstery of Beach Jeep dry, fade free and clean of sand and other grit after an ecstatic day of shredding the gnar. Portable Fridge Freezer: Staying hydrated is important, and doing so under the blazing sun can be tough. Sitting securely in the trunk, a portable fridge freezer will keep your food fresh and drinks chilled, enabling your Beach Jeep to be a mobile command center for you and all your surfer buds. Baja ATZ Tires: Don't limit yourself to paved parking lots. The deep tread and self-cleaning grooves makes the Baja ATZ tire a perfect candidate to power Beach Jeep through the sand and right up to the water. Mammoth Wheels: A classic 8-hole design with simulated bead lock aesthetic adds extra style to Beach Jeep. Made entirely from aluminum, these beefy anthracite mags won't rust from exposure to salt water or air. Tubular Bumper: Keeping with the open-air theme, a tubular front bumper not only matches well with the doors and mesh top, but adds extra strength and off-road functionality due to the all steel design. Furthermore, an integrated winch mount makes extracting Beach Jeep from a troublesome sand dune all that much easier. Production of the 2018 JL Wrangler is ramping up just as manufacture of the 2017 JK Wrangler winds down, meaning you’ll soon be able to get this exciting new take on the time-tested Jeep out on the road or trail for fresh adventures! Here are some important 2018 Wrangler & 2019 Wrangler Truck production dates that give you a snapshot of this thrilling new era in the Jeeping world. November 2017: The 2018 JL Wrangler Order Banks open – enabling you to go to your local dealership and put money down on a new Jeep, so that you can get it as soon as possible. November 15th, 2017: On this date, the assembly lines in Toledo, Ohio started building the first JL Wranglers, getting mass production underway to prepare for early 2018 shipment. January 2018: You should be able to turn the key in the ignition of your new JL Wrangler sometime in January 2018 when the vehicles arrive at dealerships for sale and pickup. July 2018: 2018 model year production ends in July, allowing FCA to switch focus to building the 2019 JL Wrangler, developing its new features and improvements. September 2018: In September 2018, FCA will start putting together the eagerly awaited 2019 JT Wrangler pickup truck for the 2019 model year, to be released early the next year. These items are just the beginning of all the possibilities you'll be able to choose from to make your Jeep work just like you want it to, but it does show you what other Jeepers have in mind for their machines. Head over to the ExtremeTerrain Blog to get the latest modding ideas and to let us know what you’re most excited about changing on your JL. 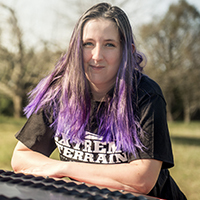 ExtremeTerrain has named a winner of its two JL Wrangler give away! The contest launched in June 2017 with the grand prize announcement being presented in a 5-finalist countdown on Black Friday, November 24, 2017. Patrick G from Summerville, SC came out on top. He will receive his pair of fully modified 2018 JL Wranglers early in the New Year. His prize package includes one Jeep decked out in Deegan 38 Parts and the other outfitted in the latest JL Wrangler offerings from Barricade Off-Road. Built hardy to stand up to the heavy-duty torquing forces and rugged work of rolling over rutted trails or crawling agilely across boulders, 3rd generation Dana solid front and rear axles come standard on the Sport, Sport S, and Sahara trims of the 2018 JL Wrangler. Outfitted with a conventional differential, these models have a 3.45 axle gear ratio, with the option to upgrade to an anti-spin differential 3rd generation Dana 44 HD rear axle. The Rubicon, on the other hand, comes standard with 3rd-gen Dana 44 HD wide front and rear axles. Its 4.10 axle gear ratio gets maximum amounts of torque into play. Both the front and rear axles come with the Tru-Lok differential system, enabling push-button axle locking and unlocking for more traction options during low-speed crawling. These axles feature heftier tubes and forgings so they can successfully overcome any challenge or stress that the trail throws at them – plus offering improved long-term durability. Cranking out the power you need to conquer most trails and wheeling or crawling adventures, the standard engine across all trims of 2018 JL Jeep Wrangler remains the staunchly effective 3.6L Pentastar V6 24V VVT engine. This motor develops 285 horsepower and 260 ft-lbs of torque, and comes with efficiency-boosting ESS that you can switch on or off as desired. A second, brand-new engine choice is the 2.0L eTorque I-4 Turbo engine, which hits the road with 265 horsepower and 295 ft-lbs of torque at your command. A third option, the 3.0L EcoDiesel V6, has electrified the Jeeping community with the new possibilities it offers, but looks to have been delayed – possibly until April 2018, or more likely until the 2019 model year, by trouble with meeting emission standards. 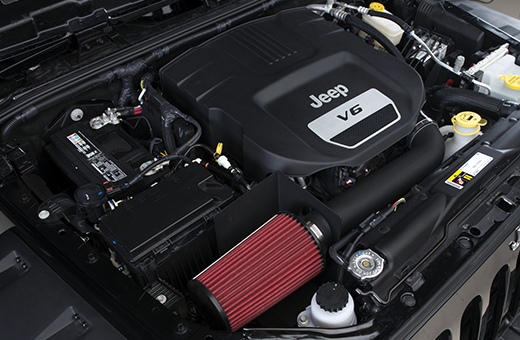 This engine offers a fairly standard 262 horsepower, but also generates a whopping 442 ft-lbs of torque, which will turn your JL Wrangler into a towing juggernaut. 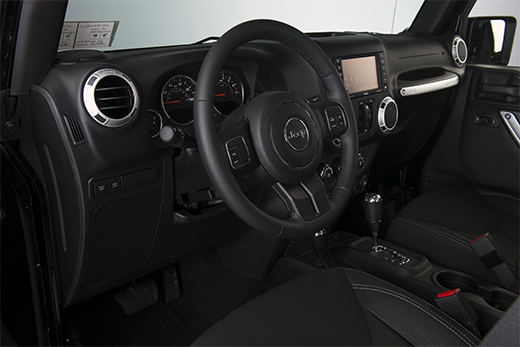 The 2018 Jeep Wrangler JL keeps the familiar manual transmission option as the standard for all trims fitted with the 3.6L Pentastar V6 engine. This 6-speed manual transmission has been fine-tuned and improved, offering a crawl ratio of 84.2:1. The 2018 JL also features an 8-speed automatic transmission, which is optional with the 3.6L Pentastar V6 and is fitted standard to Wranglers powered by the 2.0L eTorque I-4 or 3.0L EcoDiesel (with no option for manual transmissions for these engine choices). The 8-speed automatic has a crawl ratio of 77.2:1 and works smoothly and strongly on-road or off. The 2018 JL Wrangler takes a significant jump into the modern era with both its soft and hard top configurations. The removable top is a signature part of any Jeep and lets you enjoy the summer breeze streaming through the cab, as well as giving you a huge field of view of when you’re negotiating a tricky, technical area of trail. The 2018 Jeep JL features three different tops in all. The Sunrider soft top, available on all trims, frees you from wrestling with zippers that can wear out or get stuck. Locking together with a system of interlocking channel edges and a spring-assisted design, it can be attached or removed with great speed and handiness. Separately removable windows give you the option to drive with roof section of the top still in place but the sides open, or to remove everything. A Premium version of the Sunrider is quieter and more stylish than the basic version, coming in black or tan for the Sport S, Sahara, and Rubicon trims. 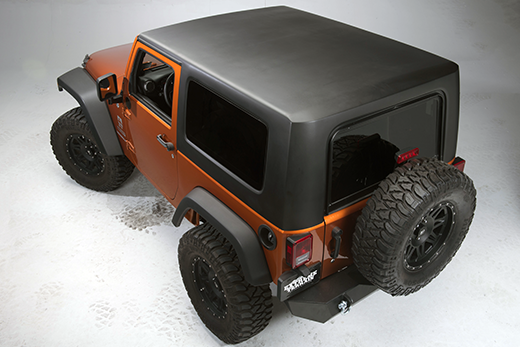 Cutting 20% off the weight compared to the older hard top, the Freedom Top 3-piece Hard Top provides easy handling and plenty of different coverage options depending on which panels you remove. The Freedom Top comes in both black and body-color variants to match your aesthetic preference, with body color tops available on the Sahara and Rubicon. Finally, the 2018 JL Wrangler adds the first ever power top to the Jeep lineup – the Sky One-Touch Power Top that folds back even at highway speeds at the push of a button, optional on the Sahara and Rubicon. The Sky Power Top includes a rear window defroster and a rear window washer/wiper setup, offering even more all-season convenience. Extra room to stretch your legs or stow cargo is added by the lengthened wheelbase of the 2018 JL Wrangler – though that doesn’t come at the cost of maneuverability, since the reworked suspension geometry cuts the turning circle by 12” compared to the 2017 JK. The reworked interior looks better and offers better views out the windshield, which can be a major help during tight-space wheeling on the trail. Instead of slippery hard plastic, most interior surfaces now feature a grippy rubberized coating that turns the whole interior into a series of grab handles so that passengers can brace themselves in most positions when you’re bouncing over rough terrain. There’s also an array of modern electronics, including 5” touchscreen U-Connect infotainment on the Sport and Sport S, and a 7” standard touchscreen in the Sahara and Rubicon. All trims include power windows, 12-volt front and rear power outlets, and four USB ports, two in the front and in the back seat. You’ll also get some luxurious leather wrapping in the Sahara and Rubicon models, whether optionally (park brake handle, shift knob, instrument panel) or standard (a leather-wrapped steering wheel, which is also standard on the 2018 Sport S). Scheduled for a triumphant return in 2019, the JT Wrangler “Scrambler” pickup truck is an off-road and on-road vehicle that’s eagerly awaited by the many Jeep enthusiasts who also want some extra cargo capacity. The JT’s rear suspension, revealed in recent photos, closely matches the Ram 1500’s, showing that it’ll have the full cargo and towing potential of other pickups in its weight class. At the same time, its Wrangler pedigree shows through in the choice of a minimum of three convertible top options – a 3-piece hard top, a body-color 3-piece hard top, and a black Sunrider soft top. Order banks for the 2019 JT Wrangler will open in August 2018, while physical production starts in October 2018 at the South Toledo plant. You’ll be able to follow the latest news about Jeep JT pickup components on the ExtremeTerrain blog, along with your favorite forums. There’ll be tons of possibilities for customizing your JT by the time it rolls off the production line regardless of whether you’re planning to use it for work, fun, or a mix of both! Chrysler is not standing still in terms of keeping up with the Joneses. The company is moving forward with the popular automobile industry trends of stronger, lighter, and better. Although the frame is being boxed by adding a fourth side to the traditional C-channel design, weight savings are coming with the replacement of steel body panels by lighter aluminum ones. No specific panels were mentioned however indicates it will be “a healthy dose”. Other noticeable changes are in the drive train as the traditional Dana 44 differential shape has been replaced by an unrecognized new design. Perhaps this is a lighter version of the 44. Speculation is that the axle is still a Dana model although no tags were present to indicate such. As much as things change, they stay the same. Chrysler recognizes this by keeping the main desires of the Wrangler; body on frame and solid axles. 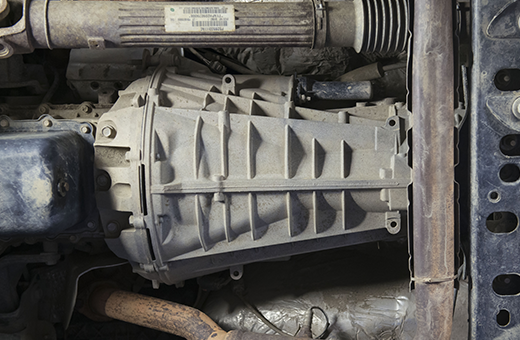 As the world transitions to unibody and independent suspension, the Wrangler maintains its original design. As popular as the Wrangler is (supposedly every one that is produced is sold) for its utilitarian looks, underneath it still features the same Jeep ruggedness for those who desire more than aesthetics. This has resulted in the popularity of the Rubicon models that enable an even more capable off-road machine straight from the factory. No doubt the new models will also generate a number of follow on products in that secondary market that is also seeing huge growth. As evidenced by the Detroit Auto Show introductions and buying trends in general, drivetrain and engine are major selling points. The Wrangler is adapting to in order to keep pace with the competition. Although the engine will most likely remain the Pentastar V-6, the new design is speculated to possess the eight speed ZF-sourced automatic. The additional speeds will spread the power more evenly and combined with the lighter weight could push the fuel mileage up a notch. More speculation surrounds the engine in terms of a possible diesel option to provide the torque often associated with four wheel drive vehicles that are geared towards low speed operation such as ‘wheeling as well as highway use. Upgrades in the looks of the Wrangler will come in the form of an adjusted distribution of body panels as well as some interior improvements. A first look at the 2018 Wrangler shows more length in the panel between the back of the hood and the windshield. This however may be a proportionate change only as the wheelbase appears to be the same. Perhaps a stretch of the body was needed to accommodate the eight speed transmission. Another possibility is the redistribution of proportions may be due to the aluminum body panels. There has been a huge amount of speculation around the roof of the new Wrangler. Multiple reports have pointed to the possibility of a modular hard top, effectively replacing and eliminating the classic Jeep soft top. Looking to give the 2018 Wrangler improved chassis rigidity, it appears as though there will a solid top that can be removed in sections, allowing you to have an open roof while benefiting from an improved and stiffened design. However, this remains one of the most highly debated aspects of the new Wrangler, as the classic soft top has been a key design component for generations. Interior improvements were speculated to feature upgraded seat covers. Many of the speculation in April 2015 including the rumor for independent suspension have proven to not happen in the later articles from September 2015 and January 2016. The Wrangler pickup is a concept that was taken from the successful CJ8 Jeep Scrambler. Whereas the Scrambler was a utility oriented vehicle, the Jeep Wrangler Pickup will focus more on lifestyle. What does that mean? In terms of the latest trends in vehicles it means the design will be oriented towards play more than work. And who can blame Chrysler for that? With the number of four wheel drive vehicles available today, the company that sought the ultimate name in four wheel drive is maintaining the niche established when the Wrangler returned to round headlights. The new pickup was flashed around in prototype photos with association to the original Jeep Gladiator full sized pickup that ran from the 1960’s through the 1980’s. Even the tailgate on the prototype vehicle had the traditional Jeep lettering styled like the old Gladiators. This original design was made in the millions and well ingrained in many a boy who owned Gladiator Tonka trucks. Depending on the attitude of older brothers, the logo may have been ingrained in skin based on how hard the truck was launched. The Wrangler will not inherit the Gladiator name according to the available information. Nor will it combine the Wrangler and Scrambler names either. That’s a good thing for those who remember the Rambler, one of AMC’s ugliest cars. Regardless of whether rumors are true or not, Jeep will maintain its success with the 2018 Wrangler by keeping with traditional elements while expanding to the long awaited pickup version. One more Jeep tradition will be maintained. The new Wrangler pickup will be produced alongside the current models in the Toledo, Ohio plant. This will keep an American based success story in America where it has been for decades. Chrysler speculates the Jeep Wrangler pickup will be available in late September of 2018. Other news indicates that entry level prices for the Wrangler will be $25,000 which when considering the demand and ability to retain value, may be a price low enough to appeal to a large number of potential buyers.